I wanted to share one of the many projects I have wanted to do but never seem to finish. I have been seeing old bottles everywhere, and I wanted to do something with the ones that I found in my grandfather's old garage. I really wanted to put them in the box, but was not sure that would work. After seeing an inspiration photo, I decided to do it. They were really dirty, so I got out a galvanized tub and put the bottles in with oxy clean, which is *wonderful* for cleaning out the inside of things. Although this is a smaller box with smaller bottles, I worked with what I had. I am, however, planning on making having my husband make a smaller version. I put one leyland cypress branch in every other bottle and a chunky candlestick in the others. I actually had cypress in each one, but I like to have candles on the table, so I took every other one out. This wire was on each of the bottles and was holding them to a rod in the garage where they were hanging. I decided to leave some of them knowing my grandfather put them there. I like the added interest also. So yet another idea for the box. This is also one I can change out with different stems/flowers as they come into season. I also have plenty of green bottles I'm going to try. Also I decided a facebook page was much more manageable than the Far Above Rubies facebook account I have already, so I would love to have you go by HERE and join. i love this mabe i need a box for my 1 bottle i have like this !! Just show new post via FB!Love your new idea Anita, so pretty, pristine and nod to your grandparents. How wonderful. Thanks for Oxy clean tip. I didn't know it was for other cleaning jobs. Will have to buy some. 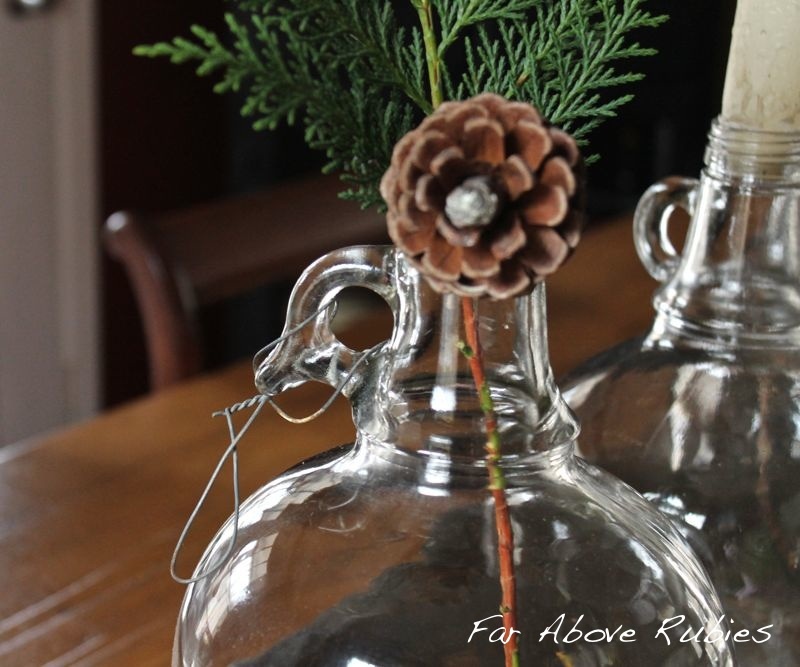 They just sparkle and look like table jewelery!What a genious way to use them all. I liked your hydrangea idea also. Thank you and many hugs.....Emelia. I am always in awe of you talented, creative people. I love the bottles and I love that you left the wire on some of them. That's so touching! They look great in the box on that marvelous table!!!! Anita! I LOVE this idea for your wonderful box!! Your grandfather would be so happy knowing you treasure all of his "old stuff" as I'm sure he, like my grandparents, called these great found objects. Your table is always so beautiful! 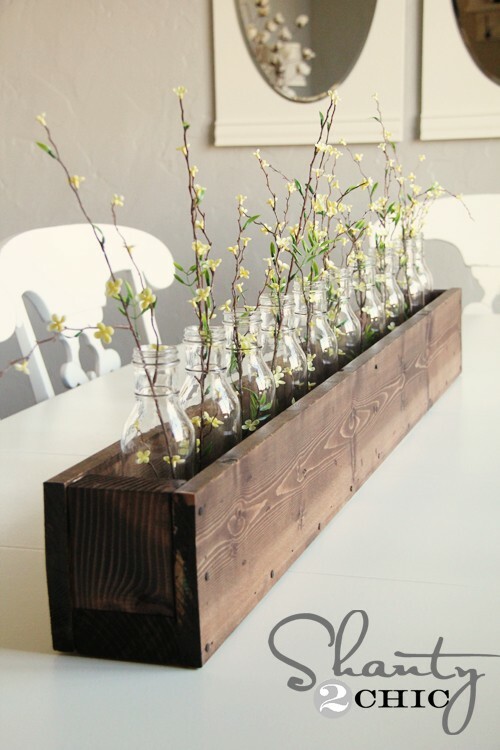 Anita....you have done an amazing job with something as simple as old bottles. Your home is just beautiful. p.s. sorry I just now became a ligit follower, lol! I had you saved on my favorites though...hehehe. 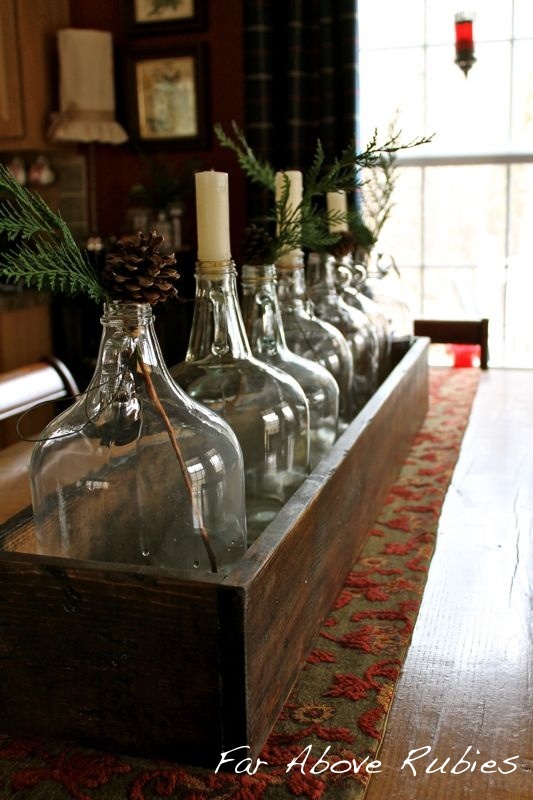 What a great idea for the bottles! Your box has indeed been versatile -- and each look is very different! Thanks for sharing. 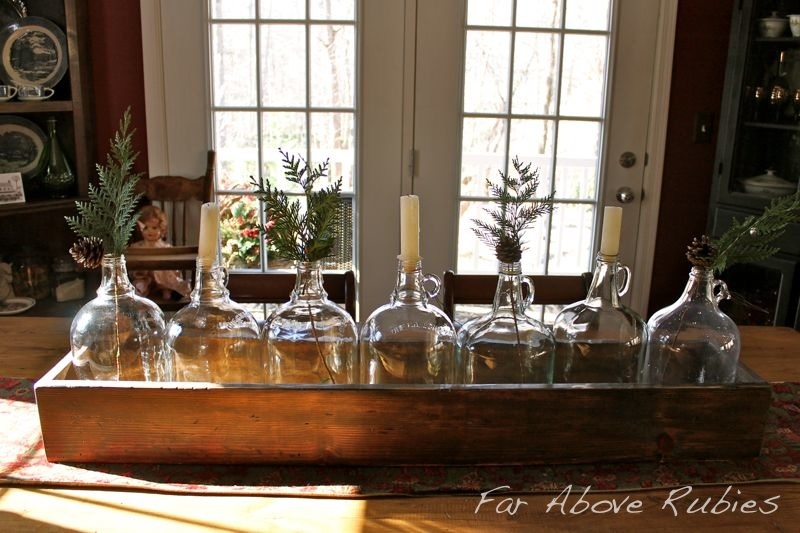 Your bottles make a beautiful tablescape. Love it. Love your display! Fabulous bottles and even more special coming from generations before. 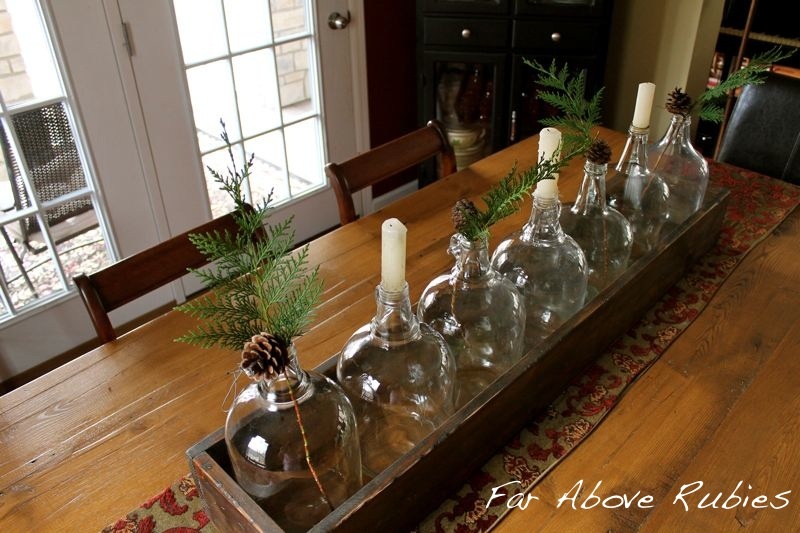 Great idea to put candles in the some of the tops. Anita, this so pretty! You always have the most creative table decor. 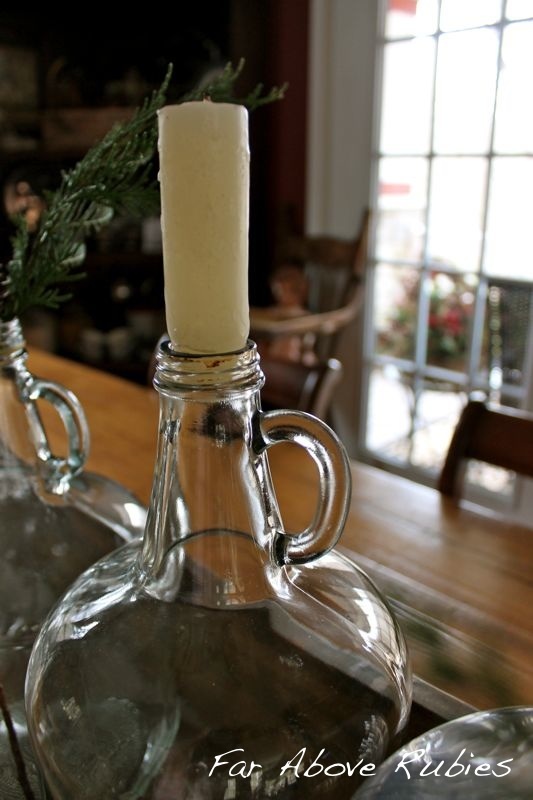 How wonderful that you could use your grandfather's bottles this way...and yes, Oxy Clean is a miracle worker!! I use it for everything! Love your new header, also!! What a lovely idea. It looks amazing. Gorgeous. It is as if the box was made to fit those bottles! This is lovely, Anita! It is beautiful in its simplicty! 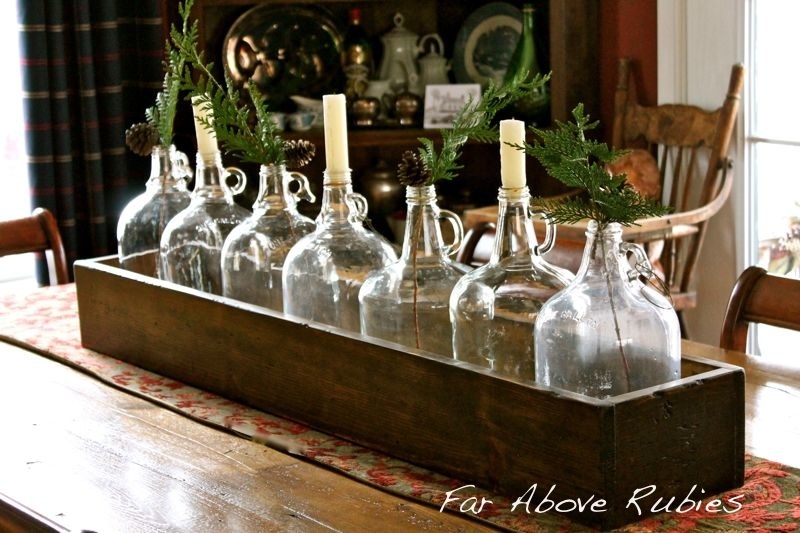 I love the greenery in every other bottle and they fit this wood tray perfectly. them in.... glad you left the wire ~ Perfection! I love the way you used the old bottles in your box (which is still one of my favorite things), and the fact that they were your grandfather's AND still had the wires that he twisted on them...that makes them REALLY special! That box just keeps getting better and better! I love how the light shines through the bottles. It is just gorgeous! Oh Anita, the wonderful box again. So many things you can do with it. I'm just enthralled and excited every time I see it. It's simply beautiful. I love the old bottles. You are so creative. I hope I learn something by hanging around with you! Love the bottles, love the box, great centerpiece. Thanks for the tip of the oxy clean, will use for my dirty old bottles. Thank's for following my blog and for your nice words! 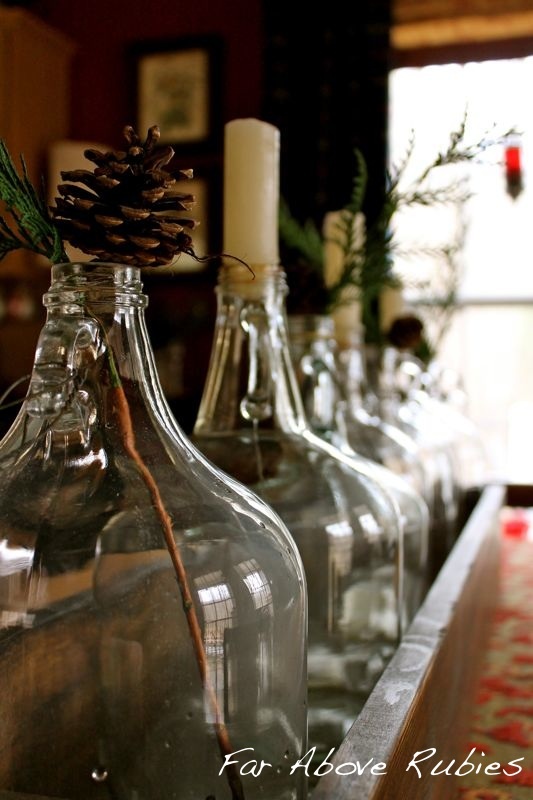 I love your blog, your old bottles, your mothers chritmas table and your christmas table. I have almost the same plates (J & G Meakin) as you have. I also follow your blog now. neat to see what you are doing with your wooden treasure box! That's a great look! I can also visualize a row of flower pots in there! I like the glass jugs in the box. I think I prefer your version to your inspiration! I love that - I collect old glass and have a great wooden toolbox too!! Like how you kept some of the old wire attached too. I really love the box. You are so clever with all you do with it. The bottles fit so nicely. I love the candles in them. I've tried to comment a few times before but it hasn't worked. Let's see if I can post this time. Love this idea! It looks perfect on your table and I like how interesting it is. So many of us (me included) just put a single item on the table, but you've used the entire center of yours. Really nice! I love the combination of the clear glass and the old wood of the box together. Anita, the photo of this post was on your side bar, so I hopped on over. Love, love, love that long box. Wonderful that the bottles were your grandfather's. 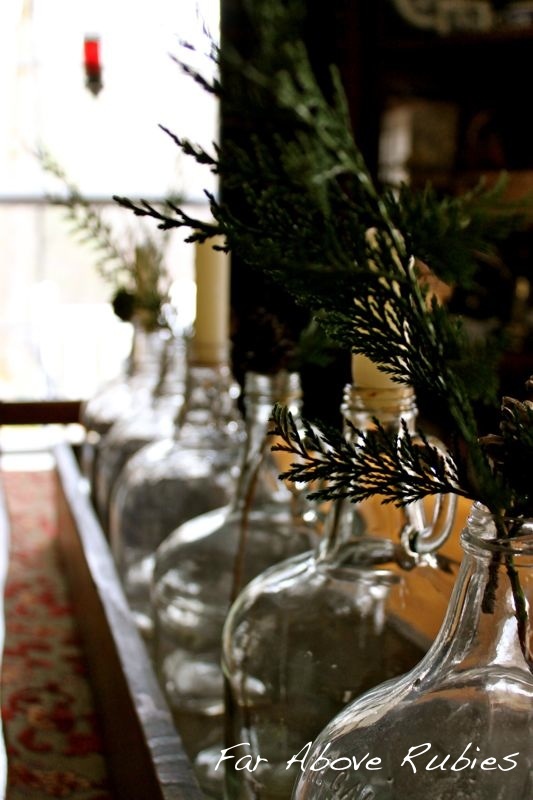 I shared a photo I took at Round Top last spring that uses a mix of old bottles in a long box. The box isn't nearly as pretty as yours. You can find that post on my blog under May 2, 2012 if you are interested in seeing it. I love this box that I first saw in your post back in Nov of last year. I'm interested in making one myself. I didn't recall seeing the dimensions in the post when you described making it. What are the dimensions of your box. Thanks! always more when it is something from family.